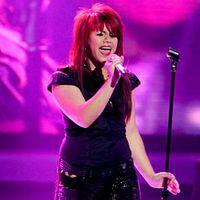 On last night’s American Idol elimination the audience voted to send hard-rockin’ Allison Iraheta packing. The 17 year old high-school student was never a huge audience favorite, despite being praised by critics and, occasionally, the judges. What it all means is that the final three of American Idol is a boy zone…though we can’t exactly accuse the remaining three contestants of having much in common besides their gender. What it also means is that there are only a few short weeks remaining in the season, and in our American Idol monthly promotion. Last night’s episode also offered some other entertainment, besides the inevitable departure of the strangely unpopular Allison. Guns n’ Roses guitarist Slash served as the mentor for the week, and joined the Idols on stage for a lively performance of “School’s Out”. And Paula Abdul even performed on the Idol stage for the first time ever, albeit in a taped performance. If you’re a fan of American Idol, I should remind you that May is Idol month around here. We’ve got a bunch of deposit bonuses that will leave you belting out easy-listening hits, and even a $10,000 cash giveaway.